We just stopped in Ifrane for a drink and toilet break on the drive to Midelt. Lahcen was describing the toilets as flush toilets, and then said that Ifrane was the most beautiful town in Morocco. I misheard and thought he said they were the most beautiful toilets in Morocco! 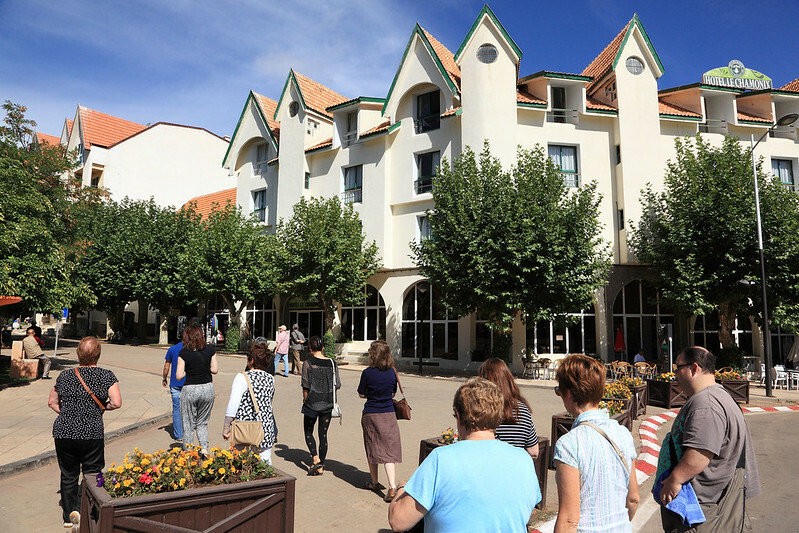 Ifrane looks very European, and where we stopped was like a Swiss ski resort with steep gabled hotels and cafes. We had a drink at the cafe of the Appart Hotel, orange juice for me, and a coffee for M. She said it was very sweet and must have already had sugar added. 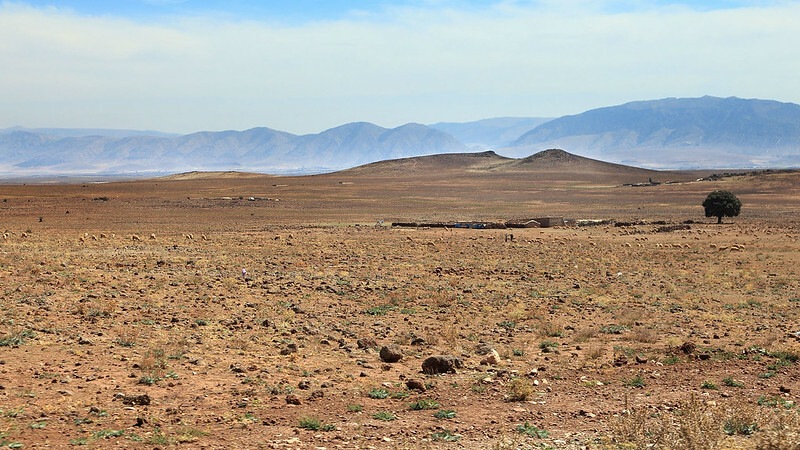 On the road to Midelt, we are passing across a hilly plateau in the Middle Atlas mountains. The scenery is a mix of rocky hills and farmland with lots of grazing sheep. Even way out here in the countryside, far away from any town, there is an astonishingly and depressingly large number of plastic bags and other plastic junk littering the landscape. Berber farmhouse in the Middle Atlas. Lahcen is giving us a running commentary in the traditions and current situation of the Berber tribes who live around here. A recent agreement after fighting over land broke out in 1998 set up a system where the tribes share the land, each farming one area for a year, then moving on and letting another tribe use it the next year, or sometimes leaving it fallow for a year. Now he is talking about the sheep farming and the traditional Muslim day of the year when lots of sheep are slaughtered in honour of the story of Abraham. We just had lunch at a place called the Taddart Hotel and restaurant, about 15 minutes drive before Midelt. It was a pretty good buffet with lots of salads, rice, lentils, Berber soup, chicken tajine, and also spaghetti bolognese. The lentils were very good, with a spicy tomato flavour. We also had an apple and some grapes. 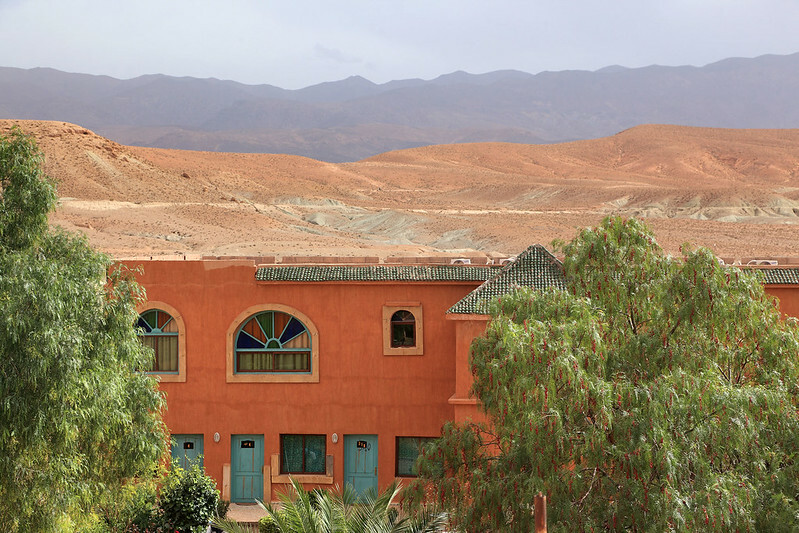 We have checked into the Hotel Kasbah Asmaa, which is just out of Midelt, in the foothills of the High Atlas mountains. We have a view of the mountains from our room. 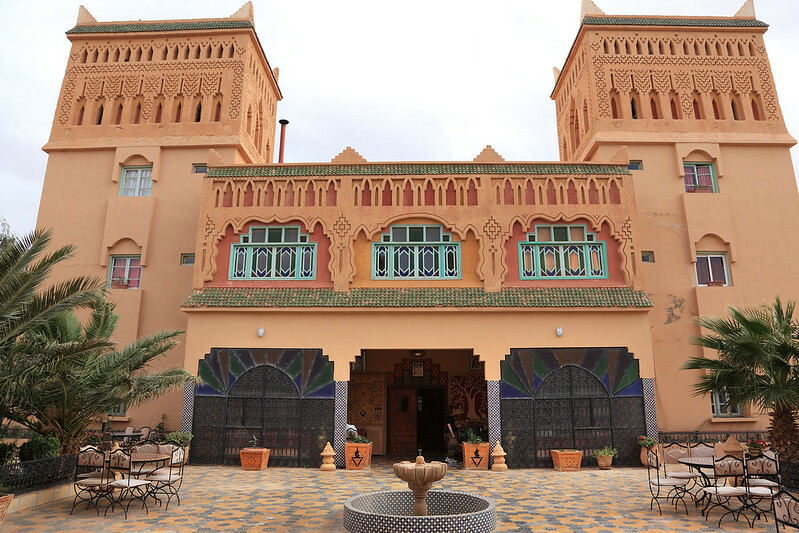 The hotel is built to resemble an old kasbah, or fortress, but is not historical – it was built in modern times as a hotel. Lahcen said the rooms here are nice and large, but ours is smaller than in the Dar Anebar in Fes. The window opens onto a rooftop with a distinct pigeon guano smell, so we’ll be keeping that closed. The room is perfectly fine though. View from our room at the Hotel Kasbah Asmaa, Midelt. We will be going on a walk towards the mountains and along a gorge this afternoon, meeting soon for the short bus trip out to the walk. Everyone is keen to go and stretch our legs, except Terry, who is suffering from a stomach upset. Breakfast this morning was the usual, the same as the last two mornings. But this time we had to pack our bags and be ready to leave the riad by 08:45. Porters carried our bags down from the room and then carted them up the hill to where we joined Mohammed and the bus. 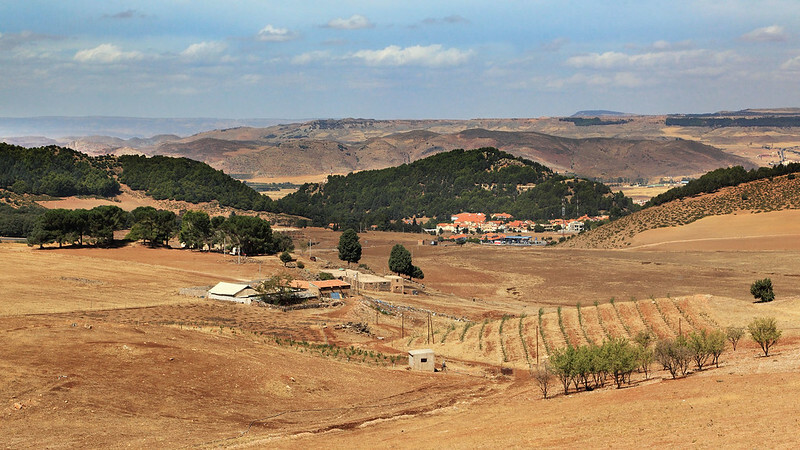 We drove out of Fes, saying goodbye to this wonderful city of huge contrasts and vast history, heading towards the ski resort town of Ifrane in the Middle Atlas mountains. Ifrane is famous for apples, and we drove past huge orchards of apple trees as we approached. Lahcen said the apple harvest was over, happening around August, but we still saw plenty of trees laden with big apples, pale green or bright red. Ifrane was very different from the cities we’ve been through. The building style is much more European, with gabled roofs to shed the snow which this region gets in the winter. There was no other sign of snow, though, and the temperature was just pleasantly cool after the heat of the cities. Middle Atlas mountains outside Ifrane. Terry raced off the bus to a toilet, as he was feeling a bit off. The rest of us wandered to the Appart Hotel for our drinks and the use of their toilets, and we had to find Terry again when he emerged. We offered him some Imodium and he gratefully accepted. From Ifrane we climbed a windy road into the mountains, through cedar forests. 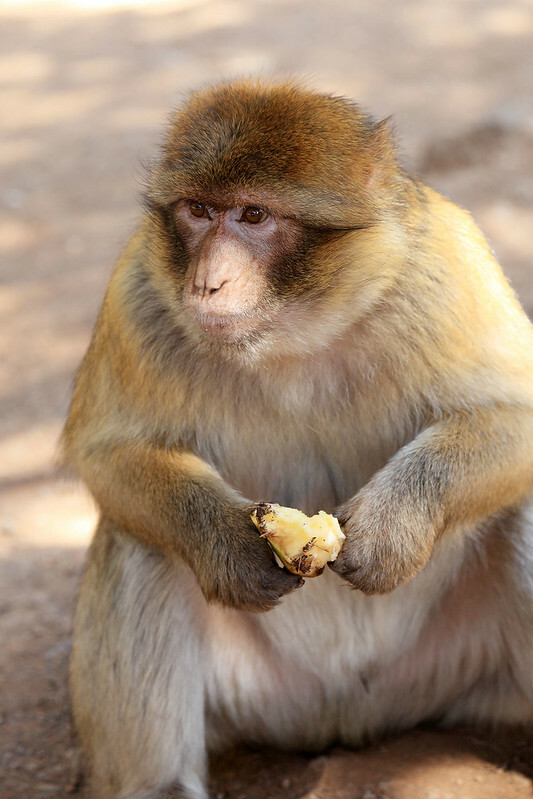 We stopped at a place in the Ifrane National Park where there was a population of Barbary macaques, to get out and have a look at them. There were several around and they were very docile, allowing us to walk up almost to within touching distance to take photos. We saw an older monkey, and then a younger one with a juvenile, who groomed each other. A short walk away were some very young monkeys, with parents. This was obviously a popular tourist spot, and there were men wandering around with donkeys with decorated saddles, selling rides, as well as a handful of other tourists, who looked like Moroccans who had just driven up there. Barbary Macaque, in the cedar forests of Ifrane National Park. 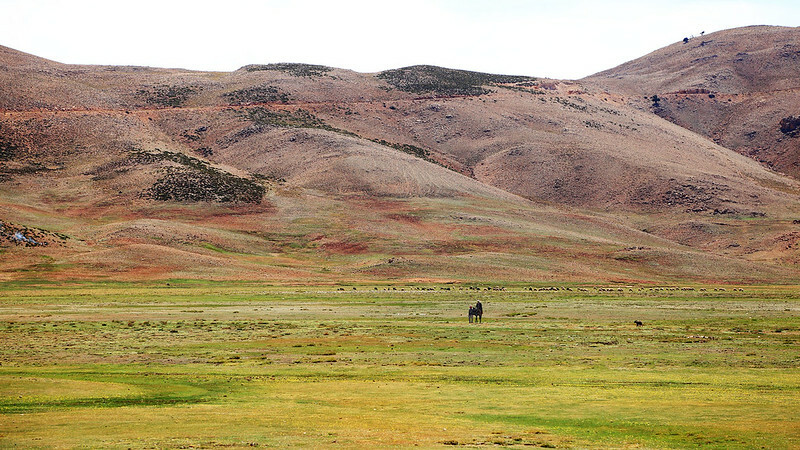 From the cedar forests we drove out on to a broad plateau, which had gentle rolling hills covered in farmland. 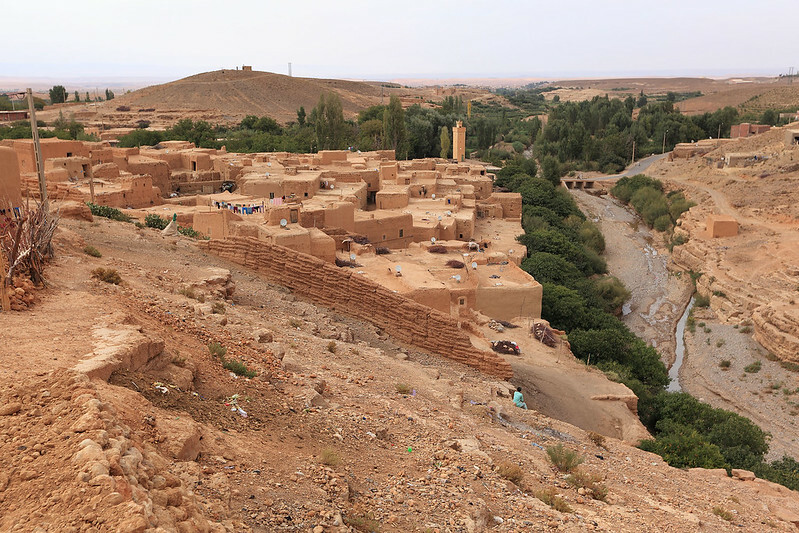 This was territory where Berber tribes lived, and we passed several camps with tents, and also permanent settlements built of mud brick where Berbers lived. This was what prompted Lahcen to explain to us about how they used and shared the land. Although some of the settlements are permanent, the people still move around in a semi-nomadic fashion. As we passed through some quite spectacular scenery, with the plateau stretching out to the looming shadow of the High Atlas mountains on the horizon, seen dimly through a haze of distance, we begged Lahcen to stop so we could take some photos. Mohammed pulled the bus over by the side of the road and we got out for a few minutes. Anna ran to an abandoned and half ruined looking building for a toilet stop and when she returned Zi did the same. The landscape here was desert-like, with a bare rocky soil punctuated by scrabbly clumps of dry and spiky looking grass. A short limestone cliff, eroded by water into channels, filled the middle distance. Courtyard of the Hotel Kasbah Asmaa. Driving on to Midelt, we passed through the town and out the other side where the Hotel Kasbah Asmaa is located. We checked into a room on the first floor, from where we can hear the fountain in the central courtyard below splashing away merrily. We assembled with all the others except for Heather for what Lahcen described as an hour and a half walk towards the mountains and to see the Berrem Gorge. We were all excited by the chance to see something different to another medina market. Mohammed drove us through the town again and out towards the mountains, then let us off in apparently the middle of nowhere. Lahcen led us across a bare rocky plain until we came across a small valley, where green trees were growing below and an aqueduct carried a stream of water across the valley to disappear into a deep cleft cut into the clay soil. 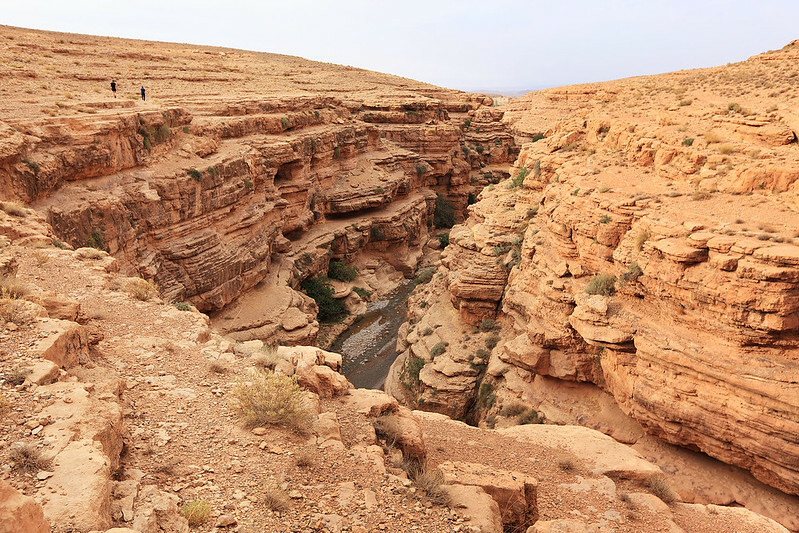 Then we walked around the edge of the valley until we suddenly came to a deep gorge in the desert, with a narrow river running through the bottom. The rocks on the far side were eroded into easily visible layers, which undulated gently to show the geological forces which had buckled the strata slightly. The predominant colour was a browny, dusty, orange. Walking to the Berrem Gorge. We walked along the top edge of the gorge, taking numerous photos, as it was fairly spectacular against the backdrop of the Atlas Mountains in the distance. Eventually we found ourselves overlooking the small village of Berrem, made of orange mud brick houses, piled next to each other adobe style. The river spilled out of the gorge here to pass through the village below us. Lahcen gave us a bit of a talk about the Berbers who lived here and their lifestyle. As he was talking, the grey clouds that had come rolling over the mountains suddenly began spitting cold, heavy drops of rain. We hustled down the crumbling soil slope into the village and then passed through it quickly to get to our bus, which Mohammed had brought around to wait for us. Lahcen warned us not to take photos of any of the people in the village. Some children said “bonjour” to us as we walked past. One young boy stopped Anna by miming that he wanted something to drink. Anna gave him her water bottle, offering it for him to take a sip, and he took the whole bottle and scarpered! She didn’t get it back, and everyone was laughing as she told the story. Along the way the rain got moderately heavy, and there was a flash of lightning and a huge roll of thunder. Thankfully it wasn’t far to the bus and we didn’t get too wet. It was interesting being caught in the rain in what looks like such a dusty and dry area, so close to the Sahara desert. We returned to our hotel for the night, where tonight’s dinner is one of the included meals on the tour. The dinner began at 19:30. Several people wanted wine, and checking the drinks menu revealed two options: vin rouge, or vin blanc. Terry inquired first and discovered they were out of vin blanc, so he got a bottle of the red, which was cold, straight out of the fridge! Some of the women also wanted wine and asked for a wine list. They got the menu which listed the rouge and blanc, and I explained to them that they were out of the blanc. Then a waiter came and said they actually had two choices of wine tonight: large or small. Apparently the rouge also came in half bottles! The dinner was an entree of vegetable soup, followed by a choice of mains, then dessert of apple tart. The soup was excellent, with a lot of celery in it, as well as rice and other vegetables. It came with bread which was chewy and had a lot of large yeast holes in it, a bit like Turkish bread but with a firmer and darker crust. The local specialty of Midelt is trout, and most of us ordered that for the main course, but M. got a vegetable couscous, Michelle got the lamb and prune tajine, and a couple of people got the beef brochettes. 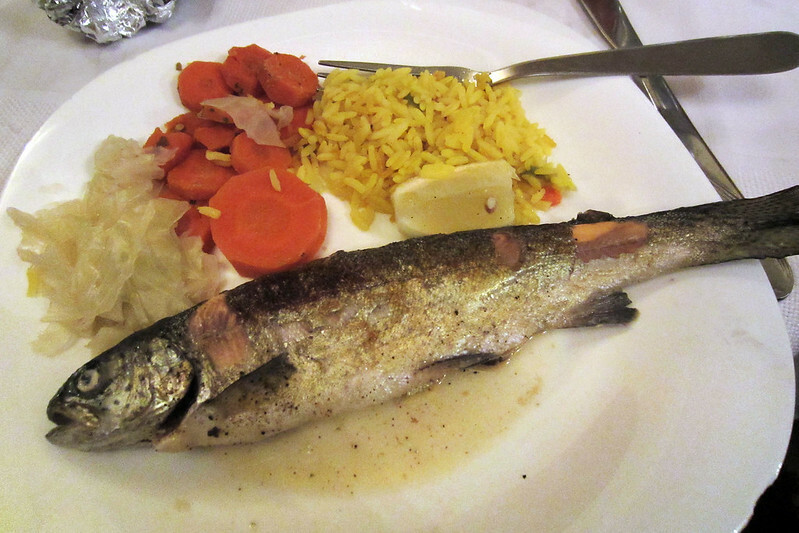 The trout was whole, cooked in foil, and very delicious, accompanied by small serves of cabbage, carrots, and rice. The apple tart was reasonably good with a nice thick and crunchy crust. Midelt trout, the local specialty. Dinner done, we returned to our room for a relatively early night. 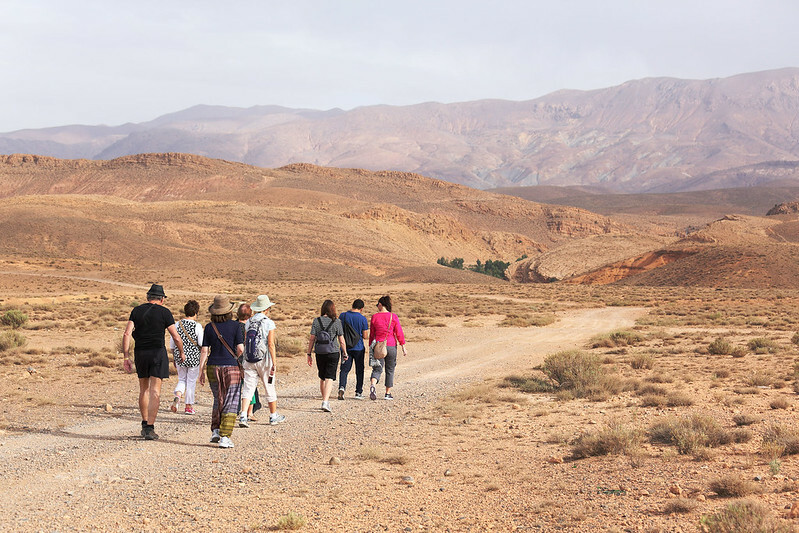 Tomorrow we need to pack an overnight bag for our camel trek into the Sahara Desert! This entry was posted on Friday, 12 December, 2014 at 21:26	and is filed under Diary, Travel. You can follow any responses to this entry through the RSS 2.0 feed. You can skip to the end and leave a response. Pinging is currently not allowed.